When you implement a finalizer, using the destructor syntax, the finalizer needs to always call the finalizer of its base class. The C# compiler will automatically take care of this, invoking the finalizer of the base class within a finally block to ensure that it gets called. Because the call to the finalizer of the base class occurs within a finally block, it will get called after all of the code within the derived class’ finalizer has executed. This means that the sequence in which the finalizers are called is from the most derived class up the inheritance chain. For example, if Terrier inherits from Dog, code in the Terrier’s finalizer will execute before code in the Dog’s finalizer. A copy constructor is a constructor that you can define which initializes an instance of a class based on a different instance of the same class. If a base class includes a copy constructor, you can add a copy constructor to a derived class, from which you call the copy constructor of the base class. 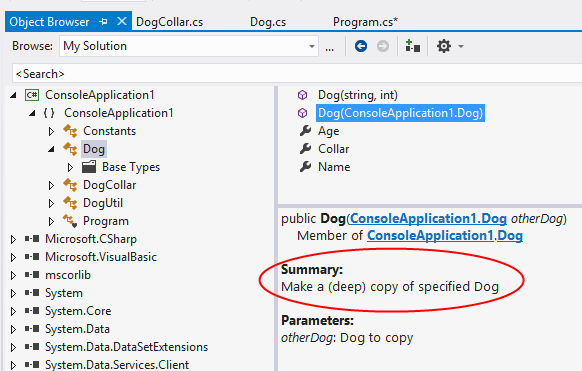 The ICloneable interface in the .NET Framework includes a single Clone method, meant to make a copy of the object it is invoked on, returning the new copy. The problem with the ICloneable interface is that it gives client code that uses it no information about whether a deep or a shallow copy (or something in between) is going to be done. Given the ambiguity and the fact that the client doesn’t really know what the contents of the cloned object will be, it’s recommended that you don’t implement ICloneable, but rather design your own interface or methods, where you can make the semantics more clear. A copy constructor is a constructor that creates a new object by making a copy of an existing object. ICloneable is a standard interface that you can implement, whereby you’ll add a Clone method to your class. The purpose of the Clone method is to make a copy of the existing object. 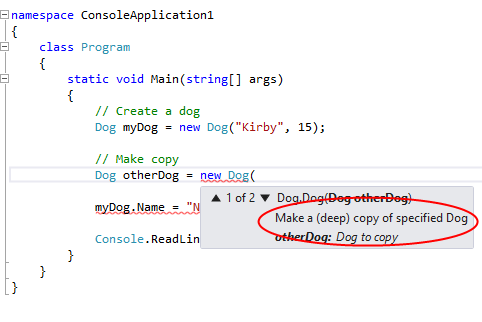 Neither a copy constructor nor the ICloneable interface dictates whether you make a shallow or a deep copy of an object. Your class can implement both methods for making a copy of an object.